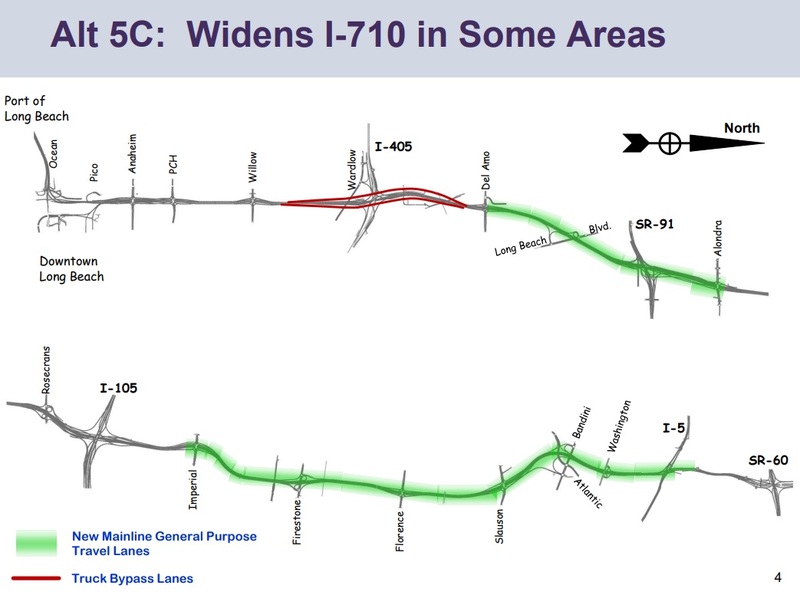 The I-710 Corridor Project claims to address “serious congestion and safety issues” in a 19-mile corridor extending from just east of downtown L.A. to the ports of Los Angeles and Long Beach. At tomorrow’s meetings of Metro’s Congestion, Highway and Roads Committee as well as the Planning and Programming Committee, Metro board members will decide whether to adopt “alternative 5C” as the locally preferred alternative. Alternative 5C would expand the freeway, adding two new general purpose lanes. Metro staff are recommending 5C as more financially feasible and more phase-able than the $10 billion Alternative 7 which would include elevated structures carrying four “clean freight” truck lanes. Community advocates pushed for solutions similar to Alternative 7 as it would not widen the freeway’s footprint. For more on the alternatives, including the “no-build” Alternative 1, see SBLA sister site LongBeachIze’s recent analysis. Metro’s staff report acknowledges but understates the funding situation for the project “full funding for Alternative 5C is not currently available.” Between Measure R and Measure M, Metro has just over a billion dollars for the lower 710. If the 55 percent cost overrun on Metro and Caltrans’ $1.6 billion 405 Freeway widening project is any indication, the lower 710 Freeway widening could easily balloon well over its projected $6 billion. They should ban trucks, and all of our goods arriving in the Port of Los Angeles can be brought to us by bicycles. People on bikes can tow large trailers right? People are more than happy to take advantage of living in an urban area where all of our goods are shipped to us, but then don’t want the infrastructure to facilitate their lifestyle. Either move to a farm in the middle of nowhere and grow your own food, or get out of hte way and let the adults run the city. They could maximize the Alameda Corridor. They could toll the existing roadway for cars – the Trump Administration has approved tolling previously toll free interstates for improvements. Ultimately, IMHO even if Alternative 5C is approved very little will get built. Widenings and interchanges will be implemented piecemeal as funds allow, but there is no appetite to spend money on a freeway that won’t pay for the added operational and maintenance costs. I recently rode the Blue Line between the Green Line transfer station and Long Beach. The City should be ashamed of itself. The train kicked up its heels, with quick runs between the well-positioned station, at least, until it hit the City Limits. And then it sat. And sat. And sat at three arterial crossings. You can certainly tell who runs things in the City of Long Beach: the auto dealers. Dudette, you know about the Alameda Corridor, right? Na, na, na, na! Not so fast. Trump has tentatively cleared the way for PRIVATE ENTERPRISE to “toll the existing roadway for cars”, AFTER the roadway is sold to the highest bidding Friend of Don. They aren’t going to let a bunch of Socialists toll Red Blooded Amurrican Drivers. Only Capitalists can do that! Alameda Corridor is underused and losing money, but let’s widen the freeway?? Here’s an idea…if Caltrans and LA feel it is so important to pour billions of dollars into a freeway widening, how about they compromise on the width of the widening? Does every single lane on a freeway need to be 12′ wide, or can those widths be reserved for the rightmost lanes where trucks are expected? Do all shoulders need to be as wide as they are? If you take a 10 lane freeway that has four shoulders and modestly reduce some of the widths – have 6 lanes at 11′ and take off a foot off two shoulders, for instance – you can reduce the widening by 8′. That may not seem like much but when you add up the costs and environmental/social impacts of freeway widenings, 8′ over 19 miles can add up quickly. That’s over 800,000 sq feet or 745 acres of land not impacted, of asphalt and concrete not needed. Alternative 1 seems like the sane choice. I think combining alternatives 5c and 7 are the best way to go. That way there is more general purpose lanes plus the zero emissions corridor. This is long overdue and needed. This along with the 405 expansion in Orange County and South Bay and the new Santa Ana Corridor Rail line will help with mobility in this area. Can’t wait to see it come to fruition. Now we need to get the 710 tunnel back on track! These are discussion I enjoy having. You are right. Innovations need to happen to reduce the actual footprint of the freeway and better ways to increase connectivity such as tunnels or caps in certain areas. More vegetation planted alongside is preferred as well. It would be nice to see these shoulders be open to vehicle traffic during rush hour and then closed off when traffic lowers. Rail is not the magical answer and regardless of what exists here, there are other problems on a regional scale that need to be addressed as well. I am not against rail for freight and advocate for it actually, but this freeway needs to be widened regardless of whether the port gets more investment for its rail ways. I think rail will become even more obsolete when autonomous trucking kicks into action. These are things to consider before spending billions on new railways.